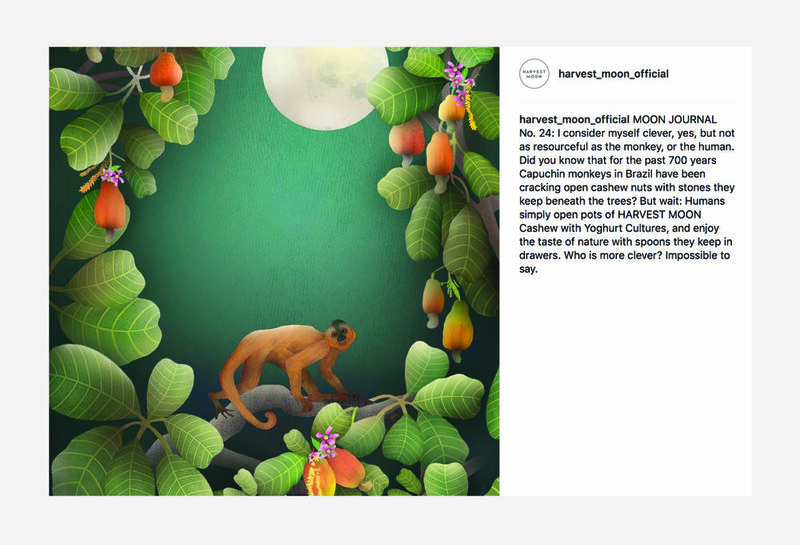 Instagram campaign, tailor-made for Harvest Moon, in collaboration with illustrator Anne Smith. Above: a series of posts from the Cashew launch. Illustrator, Anne Smith. Above: Covers and selected spreads from the Harvest Moon brand brochure. Illustrator, Anne Smith. Concept packaging and support materials for special edition Dark Berry, designed to raise money for Dunkelziffer, a German organization that fights sexual abuse against children. In collaboration with Irving and Co. and illustrator, Akira Kusaka. The Harvest Moon introduces himself to Germany. Launch Outdoor. "One of my best coconuts in every pot." Illustration: Anne Smith. Website design with Irving & Co. Illustrator Anne Smith.